This right-handed pitcher has command throwing in the mid-60s and made a splash at the So Cal A’s Invitational last summer. It was the beginning of a great run for Kliethermes, who led her Aces to a 43-game winning streak, during which she picked up 290 Ks over 153 innings for an outstanding 0.729 ERA. This fall she handed a loss to the Beverly Bandits-Conroy. She was a first-team all-state player on her Wardsville (MO) Blair Oaks team. Kliethermes had a standout no-hitter in the state semifinal playoff game, striking out 19 batters in a single outing. With interest from multiple Power Five programs, this serious pitcher is heading to the northwest to Oregon, where she will hope to lead Mike White’s Pac-12 program to continued success. Donihoo’s strong 2017 season in club and high school ball propelled her into the Hot 100 as she led her Mustang (OK) High team to the state championship and during the summer she batted .449 with an on-base percentage of .529 and 20 steals and was third on Ryan Taylor’s DeMarini Aces squad in RBIs and home runs. Donihoo has the speed at 2.7 home-to-first to leg out gap hits into extra bases as shown by her .421 high school batting average which included 15 doubles. On defense, she reads the ball well, isn’t afraid to charge, has 65 mph overhand velocity and uses her command of the quick-release style to shut down the short game. The infielder was spotted by college coaches during her 8th-grade season and visited LSU and Florida along with her eventual choice, Missouri, and soon thereafter committed to Mizzou. Moll has been a premier soccer player prior to this year and is now competing full-time in travel ball. She has impressed so many in a short period of time, receiving an offer to Mizzou where she’ll follow in the footsteps of Ace alums Kendyll Bailey and Callie Martin, two former PGF All-Americans. Moll is primarily a catcher, but her athleticism translates to almost every other position where she can play if needed. Behind the plate, she has been clocked with a 1.67 pop time and 65 mph overhand. She had a big season for her Eureka (MO) High team, batting .500 with 13 home runs, 51 RBIs, and 16 steals to earn first-team all-state honors. In club play, she hit .478 and led the Aces in homers with half her hits being for extra-base hits (1.62 OPS). Kildow, a native of Arkansas, is a two-way threat both in the circle and at the plate. As a freshman at Gravette High School, Kildow recorded an impressive line finishing with a 0.53 ERA on 185 innings pitched all the while breaking the strike out record fanning 331. In the box she led her team with a .443 batting average and 32 RBIs which further solidified her spot on the All-State team. Kildow plays her summers with DeMarini Aces and, in the heart of their lineup, batted .425 with a nearly .500 on base percentage. Kildow entertained multiple college offers before deciding to stay in-state at Arkansas. Hobson is a prototypical leadoff hitter who can flat-out fly. Her 2.7 speed down the line puts immense pressure on the defense which is a huge reason why she led the Aces in batting this past summer with a .432 average and 93 stolen bases. Hobson did the same for her Belton High School team, boasting a .547 average. When in the outfield the speedster can cover a tremendous amount of ground and her strong arm keeps runners honest on base. With offers coming out of the Big 12, SEC, and Big Ten, Hobson hopes to make her commitment after the fall. The #1 2021 Hot 100 recruit almost chose a career in dance or soccer over softball but decided to give softball a try. The shortstop from Lee’s Summit, Missouri burst on the scene as former Mizzou Coach Ehren Earleywine’s most prized recruit. Playing behind Hot 100 pitcher Mac Morgan, Fiedler caught the attention of many onlooking college coaches who watched 16U team. She swings lefty hitting .534 while blasting 16 home runs and was listed as the leading RBI producer for the DeMarini Aces. As impressive as her numbers are offensively she truly shines at shortstop. Her ability to read the ball off the bat and use her athleticism to get to the ball are unrivaled. Several high-level programs said she could step in and make an impact for them immediately. Fiedler’s leadership qualities and willingness to learn challenge her game make her possibilities endless. “She is just an unbelievable athlete. She has got things you can’t teach as far as size, speed, and strength,” Aces coach Ryan Taylor said. “A lot of times you get players with one of those tools, but she is gifted with all of them. 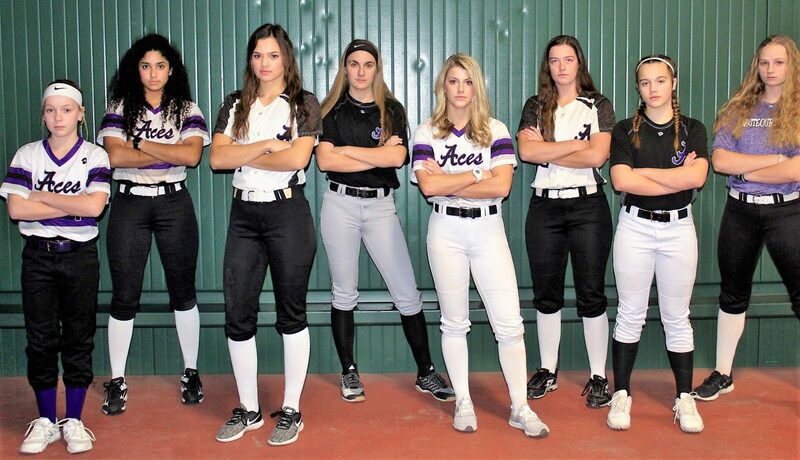 I have coached All-Americans before, but she is the best athlete overall that I’ve had.” Her overall game helped the Aces to a 5th place finish at PGF 16U Premier, 5th at World Fastpitch Championship, and 2nd at the Tulsa Elite Invite. Oklahoma State-commit, Clopton climbed up the rankings as one of the best pitchers in the nation after a very successful summer beating top-ranked teams and winning the state title for Free State High School. Not afraid to show emotion on the mound, Clopton deals her swing and miss pitches with confidence. Her pitch deception lies in her ability to throw the ball in the zone breaking plane vertically or horizontally. Clopton’s pitching chops were passed down from her mother, Sarah (Workman) Clopton who was the ace at Kansas leading the staff in strikeouts, shutouts in the 90s. She was also named team MVP and All-Big 12 First Team. Clopton’s maturity on the mound is evident gathering from a recent interview after the state title, “There was a point in the game where I told myself I need to focus. I knew I was tired,” Clopton said. “Every pitch is going to take something out of you, and you need to make sure it’s the best pitch you can make.” During PGF Nationals, she threw 35 innings with 68 strikeouts with a .589 ERA. When she suits up for OSU, she will be ready. Morgan emerged as one of the premier pitchers in the 2021 class placing in the top five of WFC, PGF, and the Tulsa Elite Invite. Throwing in the 68-69 mph range, she frustrates hitter mixing speeds. Morgan throws a heavy ball with good tail-down to her pitches. Poised and tenacious, the Aces are always in the hunt with Morgan in the circle. Her command of the zone and consistency pitching at the 16U level is why she’s one of the elite pitchers in her class. Brooks is built with a long frame and pitches in the 62-63 mph range with an overhand velocity at 63 mph. One coach said, “She is always one of the best and most explosive athletes on the field no matter where she is.” Brooks is equally skilled on the mound or at shortstop and usually bats in the three-spot for the Aces, where she hits over .400. She’s a gap to gap hitter with over half of her hits for extra bases. On the mound, she throws a heavy down ball and will get the ball more often now that she’s healthy. McNemar is a beast with the bat. The kid crushes the ball a very long way and is one of the scarier hitters in the Hot 100. The first team 4A-II All Stater helped Galena High School to the state championship but fell short. McNemar has registered exit speeds over 70 mph and is developing into a solid defender. A true power from the left side, Hoffman has reached exit speeds in the high 70s to low 80s. She hit .455 on the year with a .503 on-base percentage. Hoffman blasted 9 home runs that were good for third on the team packing a 1.250 OPS. Expect for Hoffman to find a place in the Power Five September 1 next year. She has tremendous upside and has been battle tested at the top tournaments. Dalay is known to many as “The Freak.” She’s a 6-foot beast that is a staple at third base for the Aces. Her physical presence gets her noticed, but her play on the field more than delivers. With 65 mph overhand and 70+ bat exit velocity, she can launch the ball out of the park and sling it across the field. She controls the short game at third daring speedsters to drop one. This year she hit .424 with a .500 on-base percentage. It’s no surprise her OPS is 1.364 hitting more extra base hits than singles.